My children love drinking Robinson’s Fruit Shoot, perfect to take out and about or stick in a pack lunch. It’s really good to know that a Fruit Shoot contains real fruit, in fact there’s real fruit in every drop of Fruit Shoot and each and every one is filled with multi-vitamins. 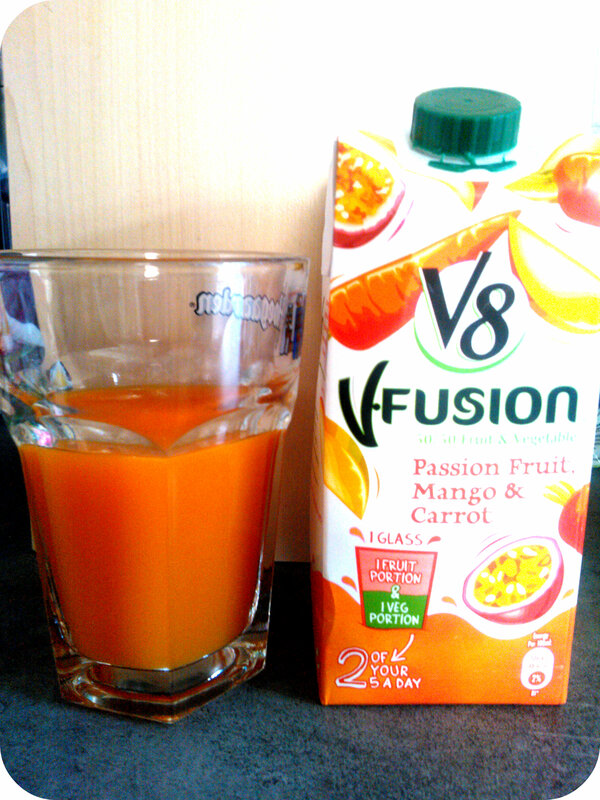 Better still, there’s no added sugar, artificial colours or flavourings at all. Inspired by the inclusion of real fruit, ex- Great British Bake Off star, Holly Bell has curated some delicious recipes suitable for the whole family that include real fruit for added flavour and nutrition. We decided to try the Apple & Pear Pancakes out as they sounded nice and warming with the added cinnamon for the cold Autumn evenings that are upon us. Make the pancake batter by mixing the milk and lemon juice into a jug. Pour liquid mix over the dry ingredients and stir until just combined. The children were first to taste and declared them delicious They were quick and simple to make, my daughter enjoyed helping me and most of all it was a tasty family dessert with some added real fruit – just like Fruit Shoots! Although both my children are pretty good when it comes to getting their daily dose of fruit, they can be a bit fussy about taking it to school. They like effortless things like a pot of grapes and would rather keep things like apples and oranges for at home when I can help prepare them etc. This is where Chilean easy peelers come in as they are so simple to peel, meaning kids can do it themselves, quickly at any time. Packed full of vitamin C and a great source of water, Chilean easy peelers are a great way to keep hydrated during the day. Also providing a rich source of fibre, calcium and magnesium they are a nutritious snack for both children and adults to enjoy. We tried these at home first and both my children got stuck in peeling one each and it was completely effortless and within a few minutes they both were eating their fruit. Having a sweet, juicy taste, the segments disappeared quickly and both of them thoroughly enjoyed their snack. With the knowledge that they were so easy to peel they were quite happy to have them in their school lunch boxes which is great as I know they are getting another one of their five a day during school hours and also it boosts their liquid intake which is important when trying to concentrate and learn new things. Chilean easy peelers have gone down a treat with my two and will now be something I add to the weekly shopping list rather than just an occasional fruit that I buy. It’s great that children can peel them so easily, meaning less work for me, and a juicy treat for them! Robinsons Fruit Shoot has long been a favourite of my children’s for picnics, days out and treats so we were pleased to take Fruit Shoot up on their foraging challenge which incorporated foraging to find our own fruit and then inventing our own new Fruit Shoot flavour. Armed with a hamper of goodies to get us going we started by looking through the ‘Food for Free’ book to get an idea of what to look for along with reading the hints and tips list created by expert Fergus Drennan to ensure we followed safety and a guide to common things that can be at this time of year. We headed outside and the children were happy to spot some apple trees and wild blackberries. Unfortunately most of the blackberries were yet to ripen but we did manage to get a couple which we took home to wash and eat. I let the children enjoy them and apparently they were very juicy and delicious! We are going to try some of the apples cooked in a tart to see what they are like but the children loved the idea that we had picked our own fruit and could actually eat it. We also want to collect some more blackberries once they have ripened to try and make some mini ice lollies with the moulds from our hamper. Obviously we needed some refreshment after all that foraging so Robinsons Fruit Shoot in Summer Fruits flavour proved a popular choice and was the perfect refreshment for a day outdoors. With our foraging trip over and feeling greatly inspired by our findings it was time to head home to invent our own Fruit Shoot flavour. The children sat quietly engrossed in their new Fruit Shoot designs, I was really impressed with their finished pictures. The 9yr old Miss M came up with an Apple & Strawberry flavour and 6yr old Mister B fancied Blueberry & Orange. I think they did really well and loved exploring what fruit can be found outdoors. It just goes to show that fruit can be fun and a little imagination can go a long way. We thoroughly enjoyed our Fruit Shoot adventure and look forward to enjoying a lot more foraging trips in the future! Pulsin’ Kids Fruity Oat Bars are a new wholesome oat based bar containing real fruit that it made to be highly nutritional and a perfect snack for kids. Coming in a variety of flavours such as Strawberry, Blackcurrant & Apple and Orange Choc Chip, there is a good choice for all tastebuds, and the biggest bonus is that each bar contains 1 of your 5 a day! I’ll be honest in that I’m always a little sceptical of these super healthy bars for kids, as no matter how healthy they are, if the child doesn’t like the taste, then they just won’t eat them, so I was keen to see how these faired with my two, aged 5 and 8. Well I think you can tell by Miss M’s face that these are a hit! She ate the whole bar and said she liked it. Her favourite is in fact the Strawberry flavour whilst 5 yr old Mister B wasn’t really fussed and happy to eat any of them. With all the benefits these have over junk food, they will always be more expensive than regular cereal type bars but if your child is getting one of their five a day, then that is worth it for me. I think these are particularly useful for school break times, which is what Miss M has used them for. Also good for when out and about, which is what I’ve used them for with Mister B as we are often hanging around waiting for the particularly sporty Miss M whilst she attends various after school sporting activities. Aimed at ages 3-9 years of which my two both fit into that bracket, they are both happy to eat them. They are suitable for vegetarians, gluten free, dairy free, soya free and contain no artificial ingredients so really fit the majority of dietary requirements. I was lucky to get to try out an Almond & Raisin Raw Choco Brownie, well you give something like that to a chocoholic and it’s pretty much a given that I’ll like it! It did taste good, but you could tell it was healthy, it was moist though and a good chunk of energy, would be great for an afternoon snack at work! 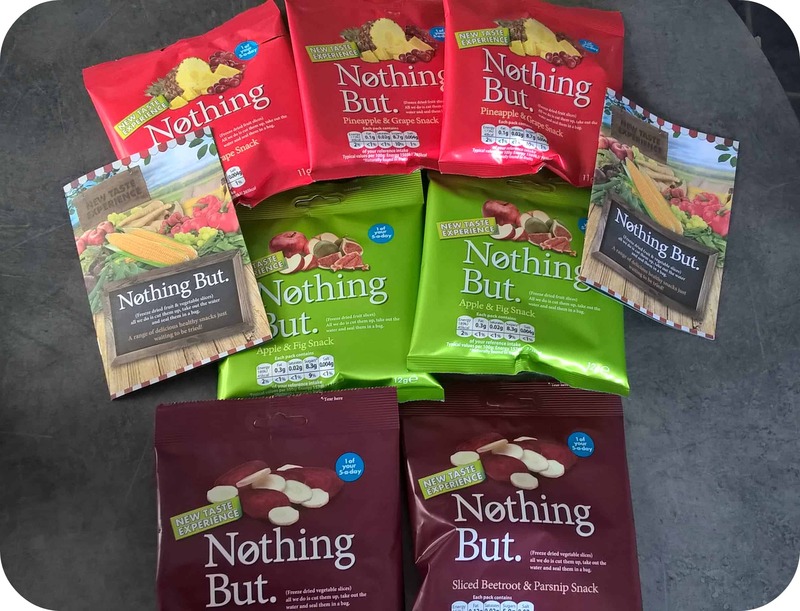 Nothing But are a unique range of snacks in that they are completely natural and each bag contains one of your five a day. With a variety of fruit and vegetable combinations available, we received a selection to try out. They are called Nothing But for a reason, there is literally nothing but the vegetables or fruits mentioned inside the bag. 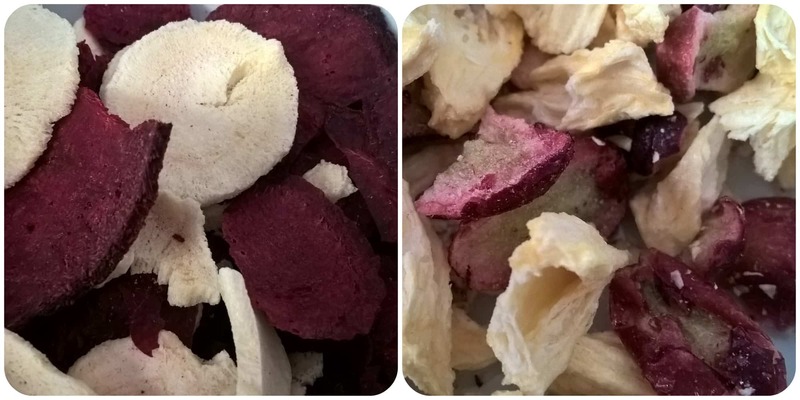 The fresh products are freeze dried which removes the water content and leaving most of the colour and all of the nutrients contained within the food. The bags have cleverly been portioned to ensure they contain the required amount of fruit or veg to give you one of your five a day. I have tried a few flavours of these before and the colours are more vibrant than I expected with the pieces being easily recognisable. They do taste like the vegetable they are but obviously a dry, crisp version. As this is nothing else added, there is no other flavours so no strong tastes to put you off. Being purely fruit and vegetables does mean that they are exceptionally low calorie, therefore I see these as being a great snack to use for healthy eating. Easy to take out and about as they come in individually portioned packs, or eaten at home, these are handy to have when you fancy a nibble, but want something healthy. All reviews are my own and my family’s opinions and we received the snacks in order to write the review. 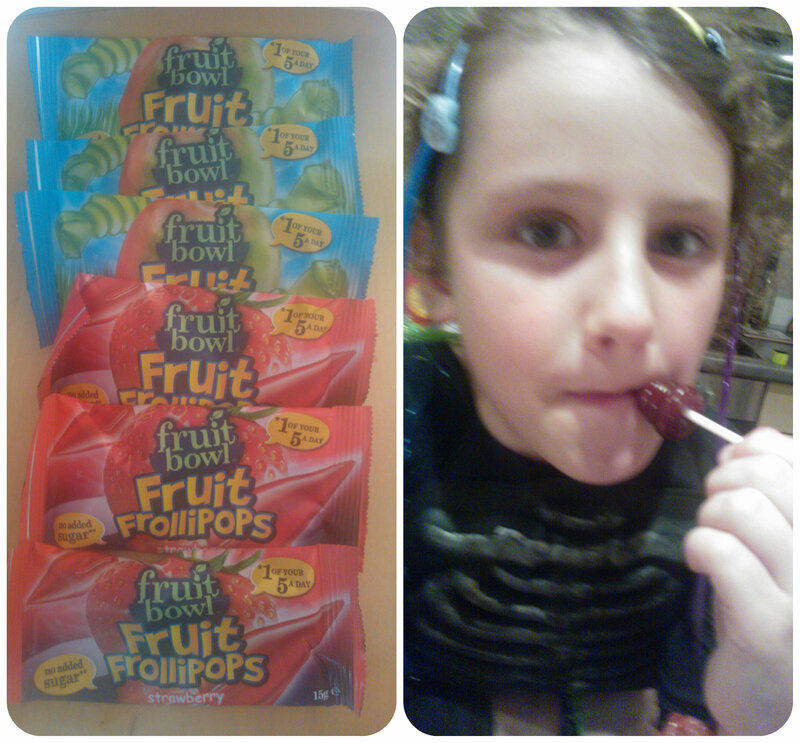 Fruit Bowl snacks have always been popular with my two children so we were keen to try their new range of Frollipops of fun shaped, fruit flavoured lollipops in two variants – Strawberry Rockets and Apple Snakes. Made with real fruit and only natural flavours and colours, each lollipop contains 1 of child’s 5 a day! Each lollipop is quite small and like a jelly textured sweet that is easy to chew. I thought my two would like the Strawberry Rockets best but it turns out they preferred the Apple Snakes. Miss M describes them as “Very tasty”. Mister B wasn’t as keen and prefers other fruit bowl snacks. These are handy to take out and about as they are individually wrapped and won’t melt and of course a healthy option!